It's been more than a few years since a Nightmare album has crossed my desk. The French metal band has been on quite a roll since their resurrection in 1999. The Aftermath is, not counting live albums and compilations, their seventh album since 2001, their ninth overall. While not having heard anything since 2008's Genetic Disorder, Nightmare seems to be covering familiar territory. Their metal invokes traditional metal, then tosses in some thrash, power, and even a tad bit of progressive metal. Nightmare's metal has always had a heavier and darker side, but not without melody, and this remains as well. For the power/thrash side of things, you'll find this within Necromancer and Ghost in the Mirror. For the slight progressive nuances, perhaps in I Am Immortal, but this song ultimately moves by the current of basic heavy power metal. Sometimes there's an eerie similarity between songs, like a variation on a theme. The Bridge Is Burning, Mission For God, and Alone in the Distance all have a certain sameness which makes them seem to run together. Some may simply call this strategic consistency, others redundancy. Ultimately, the first half of the album trumps the latter. Throughout Jo Amore's vocals seem a bit uneven. They're clear, yet still take a beating at times from the inherent heaviness of of Nightmare's metal. This is perhaps most notable within Digital DNA or the thrashers Necromancer and Ghost in the Mirror. Essentially, with The Aftermath, Nightmare stays true to their recent path by offering heavier, sometimes thrash injected, power metal. 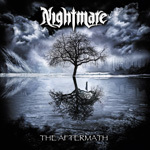 Essentially, with The Aftermath, Nightmare stays true to their recent path by offering heavier, sometimes thrash injected, power metal.